They had no idea what was wrong. And often, neither did their doctors. The not knowing nearly killed Bruce Kurth. For others, the symptoms weren't so severe, but often the condition worsened over time. Shelli Hanks, a radiation oncologist with four daughters, thought her migraines, fatigue and recurring diarrhea were "supermom syndrome." For Cheryl Wilson, the stomach upset worsened over the years ? she jokes about knowing every rest stop from Tucson to San Diego ? but it wasn't until her brother was diagnosed that she first heard of celiac disease. Also referred to as celiac sprue, celiac disease occurs when people with a genetic propensity for the disease eat foods containing gluten, or the proteins in wheat and some other grains. The result: inflammation of the lining of the small intestine, which over time becomes too damaged to absorb food nutrients. Some patients also develop an intensely itchy skin condition called dermatitis herpetiformis. On Saturday, the Southern Arizona Celiac Support group will host an informational gathering coupled with a gluten-free food fair to educate people about the disease. 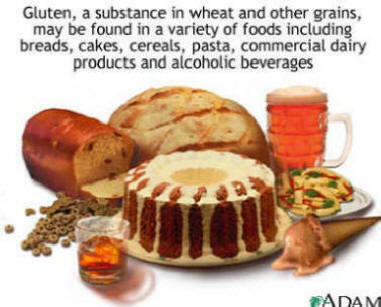 In Celiac disease the blood tests may show low folate and low iron, low B-12, low vitamins. High folate may mean low Vitamin B-12. Wilson said the event is important because it exposes people to the newest gluten-free products and "brings hope to the newly diagnosed that this lifelong treatment will not be boring." People who suspect they might be gluten-intolerant can learn more about the disorder, she said. For these Tucsonans, the diagnosis and treatment brought relief not only from chronic bouts of diarrhea and bloating, but in some cases from migraines, anemia, fatigue and depression. The solution is to stop eating anything that contains gluten. Hanks was 40 when she was diagnosed five years ago. About six weeks later, her daughter, Lindsey, also tested positive. In the years leading up to her diagnosis, Hanks thought she might have irritable bowl syndrome. Eventually, she also developed anemia, and in spite of supplements, she was always tired. "My doctor couldn't figure out why I was so tired," she said. "We thought it was supermom syndrome." The testing continued, but nothing worked. "My favorite one was, 'You're not tired. You're just depressed,' " she said. When she was accurately diagnosed, Hanks was told that one in every 5,000 people is gluten intolerant. Five years later, it's closer to one in 130, according to researchers.